NASA has confirmed that its Phoenix Mars Lander has not survived the harsh Red Planet arctic winter, and appears to have suffered serious ice damage to its solar panels. The agency has been attempting to contact the lander since January, in the slim hope it may have supported the weight of up to 30cm of accumulated carbon dioxide frost. However, NASA says that although its Odyssey orbiter last week "flew over the Phoenix landing site 61 times during a final attempt to communicate with the lander", Phoenix remained silent. Photographic evidence captured by the HiRISE camera on board the Mars Reconnaissance Orbiter appears to confirm Phoenix's fate. A picture captured earlier this month "suggests the lander no longer casts shadows the way it did during its working lifetime". 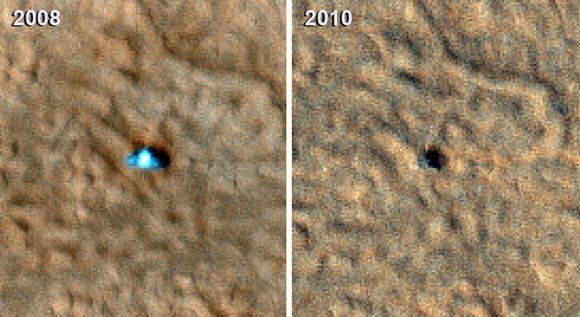 NASA explains: "The 2008 lander image shows two relatively blue spots on either side corresponding to the spacecraft's clean circular solar panels [seen in the Phoenix self-portrait, below*]. 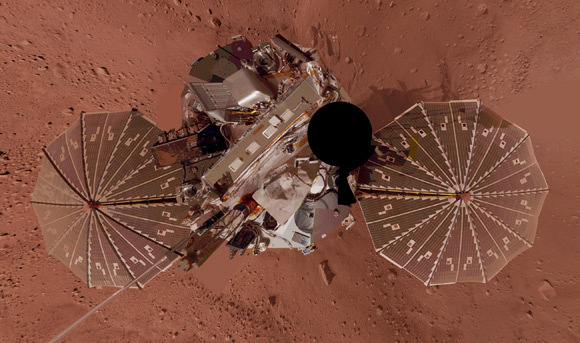 In the 2010 image scientists see a dark shadow that could be the lander body and eastern solar panel, but no shadow from the western solar panel." Phoenix launched from Cape Canaveral on 4 August 2007 and touched down on the Martian surface on 25 May 2008. It last communicated on 2 November, 2008, at the end of a mission during which it "confirmed and examined patches of the widespread deposits of underground water ice detected by Odyssey and identified a mineral called calcium carbonate that suggested occasional presence of thawed water". It also "found soil chemistry with significant implications for life and observed falling snow, and wowed scientists with its discovery of perchlorate - "an oxidizing chemical on Earth that is food for some microbes and potentially toxic for others". * NASA elaborates: "This view is a vertical projection that combines hundreds of exposures taken by the Surface Stereo Imager camera on NASA's Mars Phoenix Lander and projects them as if looking down from above. "The black circle is where the camera itself is mounted on the lander, out of view in images taken by the camera. North is toward the top of the image. "This view comprises more than 100 different Stereo Surface Imager pointings, with images taken through three different filters at each pointing. The images were taken throughout the period from the 13th Martian day, or sol, after landing to the 47th sol (June 5 through July 12, 2008). The lander's Robotic Arm appears cut off in this mosaic view because component images were taken when the arm was out of the frame."